On Tuesday, February 4, the National Labor Relations Board announced proposed rulemaking on Board elections, a second attempt at the so-called "quickie elections" rule. The proposed regulations, if they become effective, will have a substantial effect on the election process. Most significantly, the period between a petition and the election will be shortened, making it difficult for employers to communicate with employees about potentially relevant issues before the vote. The proposed rulemaking tracks a prior attempt that the Board commenced on June 22, 2011, but which fell flat. The Board mishandled the administrative rulemaking process in 2011, and it finally withdrew the regulations this past January after a federal court ruled that the regulations were invalid when issued in 2011 because the Board lacked a quorum of at least three Board Members. Hence, the second attempt, or "Quickie Elections 2.0." In a press release this week, NLRB Chairman Mark Gaston Pearce asserted that the renewed rulemaking is needed because "[u]nnecessary delay hurts both employees and employers..." He asserted that the current proposals "are intended to improve the process for all parties." Observers realize that Pearce's rhetoric gives little suggestion of the true intent behind the quickie election rule – namely, changing the election process in a way that impairs the ability of employers to communicate with and educate employees about facts that may be relevant to their election decisions, and that gives unions a substantial advantage start to finish. Under the proposed rule, a union gets the benefit of surprise with an "ambush, quickie, or snap election" petition focused on the bargaining unit that the union believes best suits its election chances. The union will promptly get from the employer information about all the employees in the petitioned-for unit – information that is invaluable to the union in its campaign for votes. Meanwhile, the employer is given a relatively short time to communicate with employees before the election. And because the proposed rule eliminates the opportunity to correct some mistakes before an election takes place, the election may proceed based on an inappropriate bargaining unit that also may include individuals, such as "statutory supervisors," who were ineligible to vote. That lack of certainty is uniquely detrimental to employers, who need to know an employee's "supervisor status" under the NLRA to avoid unfair labor practices in the critical period before an election. All three Democrat Board Members, each of whom is a former union-side attorney, voted to issue the proposed rulemaking, and the two Republican members, both former management attorneys, voted against it. Comments are being accepted through April 7, 2014. Here are the key aspects of the proposed rule. Currently, the time between the filing of an election petition and the election averages about 38 days. Assessing the proposed regulations, many commentators expect the elections generally to take place within 25 days of filing of the petition, though the proposed regulations do not specify a maximum or minimum period. Under current rules, parties are entitled to file post-hearing briefs within seven days of the pre-election hearing. Under the proposed rule, post-hearing briefs are allowed only in the discretion of the Regional Director. In other words, it appears that the "default" will be no post-hearing briefs. The effect of this will be to cut yet another seven days from the period before the election. Whether the number of eligibility issues is great or small, they are often critical to allowing the employer to conduct a lawful and effective campaign. Employers need clarification before the election as to whether lead persons, foremen, or employees in similar roles are "employees" for purposes of the NLRA (meaning that they are eligible to vote and are protected under the NLRA), or instead are "statutory supervisors" (meaning that they are ineligible to vote, not subject to the NLRA's protections, and may campaign for the employer). An employer who does not know where these "gray area" employees stand is more likely to commit an unfair labor practice inadvertently or – out of an overabundance of caution may be deterred from lawfully including them in management team communication efforts. The proposed rule provides that voter eligibility issues involving less than 20 percent of the bargaining unit will be decided after the election. The hearing officer is to close the hearing if the issues raised involve less than 20 percent of the unit. Keeping "supervisor status" in limbo until after an election appears to be a deliberate attempt to put employers at a disadvantage. The proposed rule will require the parties to submit statements of position on the issues to be heard at the pre-election hearing, before any evidence is taken. Failure to take an "anticipatory" position on the scope or composition of the bargaining unit will be deemed a waiver of the position. Because the "default" bargaining unit may be what the union initially selects, this aspect of the proposed rule disadvantages employers with no corresponding disadvantage for unions. The rule is also likely to detract from the Board's fact-finding function, and will limit the legal arguments by precluding the parties from raising issues based on facts disclosed for the first time at the hearing. In a completely new requirement, the employer must give to the union a list of the names, work locations, work shifts, and classifications of employees in the petitioned-for unit before the pre-election hearing starts. This requirement is expected to benefit unions by ensuring that they receive employee information at the earliest possible stage. Failure to provide the information will preclude the employer from contesting the appropriateness of the bargaining unit or the eligibility or inclusion of any individuals in the hearing. Currently, the employer must provide the Board with the so-called "Excelsior list" seven days after an election is ordered, and the Board provides a copy to the union. The proposed rule requires that the employer provide to both the Board and the union more information than before and moves up the deadline to provide the list to two days after the decision directing an election. The current rule and the proposed rule require names, home addresses, work locations, shifts, and job classifications for the voters in the unit. The proposed rule also requires that the employer provide available phone numbers and email addresses, which obviously gives the union greater access for communicating with employees. Failure to provide the list is a basis for an election objection by a union. Under current rules, a party has 14 days from the date of the direction of election to request Board review of the Regional Director's decision. The proposed rule eliminates the right of parties to seek review of a Regional Director's direction of election until after the election takes place. This avoids the 14-day time period for seeking review of the Rregional Director's direction of election but at the cost of having an election that may be in an incorrect group or otherwise be inappropriate. The NLRB's current regulations provide that a Regional Director should not "normally schedule an election until a date between the 25th and 30th days after the decision" directing an election, so as to permit the Board to rule on any request for review filed in the 14 day period before the election is held. That scheduling regulation, which currently builds 25 to 30 days into the critical period before an election, is eliminated in the proposed regulations. The proposed rule requires that any post-election hearing involving challenges to the election be held within 14 days of the election. In addition, review by the NLRB will no longer be available as a matter of right, meaning that review by the full Board is discretionary and the Regional Director's decision may be final with no review. Currently, the NLRB and parties must use paper copies for filings and notifications. Under the proposed rule, the parties may file petitions, notices, and voter lists electronically, and the Board may send communications electronically. The petition is filed on Day 1, and the Regional Director promptly serves notice of a hearing to take place seven days later. On Day 7, the pre-election hearing takes place, and an election is directed. Final notices of election can go out immediately at that time, and then the employer must post the notices two full days before the date of the election. These required actions take up Days 8 and 9. No later than on Day 9, the final eligibility list must be provided to the Board and the union. In the summary overview issued by the Board with proposed regulations, the Board states that "an election shall not be scheduled for a date earlier than ten days after the date by which the eligibility list must be filed and served unless the requirement is waived by the petitioner and any other parties on the ballot." Thus, with the requisite waiver, which a union might grant to expedite the election, an election could be held as early as Day 10. Without the waiver, the election could be held as early as Day 19. Under the proposed regulations the Regional Director is commanded to "schedule the election for the earliest date practicable consistent with these rules." With the elimination of the currently required 25-to-30-day period before the election, a Regional Director can now be expected to schedule elections for dates as soon as "practicable" after the pre-election hearings and provision of eligibility lists. The periods of seven days for post-hearing briefing and 14 days for pre-election review will be gone – taking 21 days out of the scheduling equation. Under current Board guidelines, elections are to be held not later than 42 days after the filing of the petition. Under the proposed regulations, Regional Directors can be expected to schedule elections well inside that 42-day limit – probably within about 25 days of petition filing. The Board will be considering all comments filed previously by interested parties during the June 2011 rulemaking process. In addition, as stated above, it will be accepting public comments on the new proposed rulemaking through April 7, 2014. Replies to any comments will be accepted through April 14, 2014. Detailed instructions on where and how to send comments are at the link to the proposed regulations in the first paragraph of this Bulletin. The Board will also hold a public hearing during the week of April 7. With its 3-2 Democrat majority, the Board is expected to issue some version of a final rule shortly after the public comment period ends. However, there is at least a chance that the Board majority will delay issuing a final rule until just after the November 2014 mid-term elections. Not surprisingly, Republican leadership on the U.S. House of Representatives Education and Workforce Committee is displeased with the proposed rule and will be holding a hearing on March 5. Constangy attorneys, along with others in the employer community, will be watching this issue closely and submitting comments. Employers would be prudent to plan for some version of the proposed rule to come into force later this year. Constangy, Brooks & Smith, LLP has counseled employers on labor and employment law matters, exclusively, since 1946. A "Go To" Law Firm in Corporate Counsel and Fortune Magazine, it represents Fortune 500 corporations and small companies across the country. 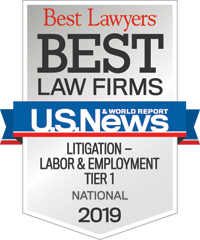 Its attorneys are consistently rated as top lawyers in their practice areas by sources such as Chambers USA, Martindale-Hubbell, and Top One Hundred Labor Attorneys in the United States, and the firm is top-ranked by the U.S. News & World Report/Best Lawyers Best Law Firms survey. More than 140 lawyers partner with clients to provide cost-effective legal services and sound preventive advice to enhance the employer-employee relationship. Offices are located in Alabama, California, Florida, Georgia, Illinois, Massachusetts, Missouri, New Jersey, North Carolina, South Carolina, Tennessee, Texas, Virginia and Wisconsin. For more information, visit www.constangy.com.